Rishi Vishwamitra who is considered to be author of Gayatri mantra in Hindu tradition. In above image, Menaka trying to win him over from an aloof ascetic life to a householder life. In the Vedas the term Rishi (Sanskrit: ऋषि ṛṣi) denotes an inspired poet of Vedic hymns. Post-Vedic tradition of Hinduism regards the Rishis as "seers", "sages" or saints, who after intense meditation (Tapas) realized truths and eternal knowledge, which they composed into hymns. More than a century ago, Monier-Williams tentatively suggested a derivation from drś "to see". Monier-Wiliams also quotes the Hibernian (Irish) form arsan (a sage, a man old in wisdom) and arrach (old, ancient, aged) as related to rishi. In Sanskrit, forms of the root rish become arsh- in many words, (e.g., arsh). Monier-Williams also conjectures that the root drish (to see) might have given rise to an obsolete root rish meaning "to see". However, the root has a close Avestan cognate ərəšiš "an ecstatic" (see also Yurodivy, Vates). Yet the Indo-European dictionary of Julius Pokorny connects the word to a PIE root *h3er-s meaning "rise, protrude", in the sense of "excellent". 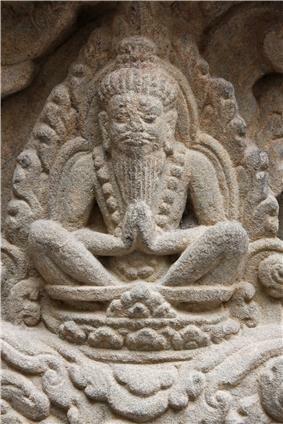 The main rishis recorded in the Brahmanas and the Rigveda-Anukramanis include Gritsamada, Vishvamitra, Vamadeva, Atri, Bharadvaja, Vashista, Angiras, Kaṇva. Seven Rishis (the Saptarshi) are often mentioned in the Brahmanas and later works as typical representatives of the pre-historic or mythical period; in Shatapatha Brahmana 14.5.2.6 (Brhad Aranyaka Upanisad), their names are Uddālaka Āruni (also called Gautama), Bharadvaja, Vishvamitra, Jamadagni, Vashista, Kashyapa, and Atri. Daksha, Bhrigu and Nārada were also added to the saptarshis riṣis in Āshvalāyana-Shrauta-Sutra, where these ten principals were created by the first Manu (Svāyambhuva Manu) for producing everyone else.